This eBook explores the 7 forces impacting health engagement and how successful healthcare organizations can set the tone of their own outreach to play to an audience of one. Embracing these 7 forces will improve the outcomes of your health action programs and give you results to dance to! 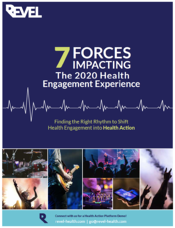 Are you ready for the 7 Forces Impacting the 2020 Health Engagement Experience?